There is enough going on that should make folks wonder whether our government is operating legally and under the framework it is supposed to be operating under. KrisAnne Hall is an attorney and former prosecutor, fired after teaching the Constitution to TEA Party groups – she would not sacrifice liberty for a paycheck. She is a disabled veteran of the US Army, a Russian linguist, a mother, a pastor’s wife and a patriot. She now travels the country and teaches the Constitution and the history that gave us our founding documents. KrisAnne Hall does not just teach the Constitution, she lays the foundations that show how reliable and relevant our founding documents are today. 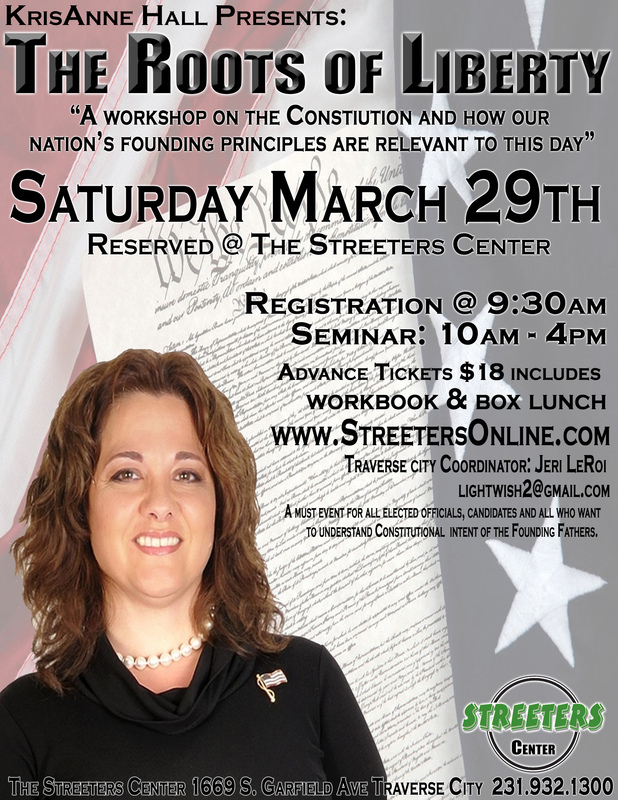 She presents the “genealogy” of the Constitution – the 700 year history and five foundational documents that are the very roots of American Liberty. One cannot properly understand or interpret the Constitution without a firm grasp of its very foundation. The flyer to the right is about the Traverse City event. The others are below. Please take time and invest in your knowledge of the constitution with a few hours spent with this tireless patriot as she explains what is being done wrong, and how we can address it. Death of Private Property Rights; and there is no right or left but all progressives pushing the United Nations Agenda for the 21st century. Moving from a Republic of sovereigns back to a Kingdom of subjects. Place: The Salvation Army, 330 Waldo Ave., Midland, MI. She does not just teach the Constitution, she lays the foundations that show how reliable and relevant our founding documents are today. She presents the “genealogy” of the Constitution – the 700 year history and five foundational documents that are the very roots of American Liberty. KrisAnne will connect the dots for you like no one else can! Nobody is teaching this. Not the 5000 year leap, not David Barton, not Heritage, not Hillsdale – yet it is essential if the Constitution is to persevere. Very intelligent, and strong-minded lady. Judging by the event prices in comparison to all the Go Team! drool the proles support in taxpayer subsidized stadiums/race tracks, it becomes clear that KrisAnne Hall is largely donating her knowledge to those who choose to become informed. Good observation. She makes no money from the event ticket sales, and the travel costs are barely paid for by whatever book sales she makes. Last year she came up to our 912 group, and it was an eye opener. This is well worth it.